Managers who cherry-pick for optimal results aren’t even the worst abusers, argues Guggenheim’s top quant. 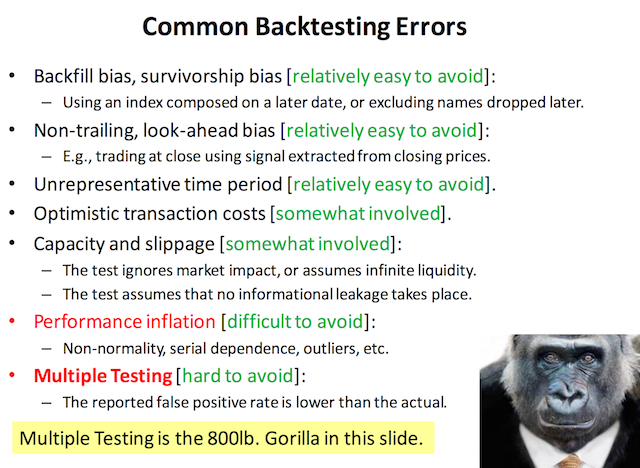 Most backtests published in finance journals are wrong, a quantitative research specialist from Guggenheim Partners has argued. “You never see a bad backtest. Ever. In any strategy.” —Josh Diedesch, CalSTRSLópez de Prado—who holds two doctorates in the subject and a research fellowship with the Lawrence Berkeley National Laboratory—has been sounding the alarm on the “pseudo-mathematics” of backtesting for several years. In a recent presentation, he singled out a common and critical error he said undermines the majority of research based on historical simulations: multiple testing. This involves running multiple configurations of, for example, a theoretical asset allocation through a set of past market data then picking one to highlight. The practice poisons the selected results with selection bias, he said. The American Statistical Society has voiced the same concern in its ethical guidelines. Grave critiques of backtesting are nothing new to institutional investing. Yet asset owners have tended to focus on managers’ use of the technique in marketing products, such as trumpeting phenomenal modeled performance over bizarre time spans. And according to López de Prado, academics are just as guilty of the practice as asset managers.